Hollywood Vibes is an outlandish black comedy farcical satire on contemporary Hollywood/LA. Hollywood Vibes is an outlandish black comedy farcical satire on contemporary Hollywood/LA. It mangles screen personalities galore and takes its comic ideas to unbridled extremes. 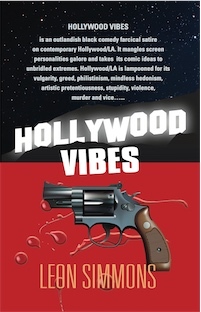 Hollywood/LA is lampooned for its vulgarity, greed, philistinism, mindless hedonism, artistic pretentiousness, stupidity, violence, murder and vice… "Think Quentin Tarantino meets Woody Allen"
I laughed out aloud, which is rare for a person who has to read as much as I do. The author is an advertising executive with many years experience with major advertising companies and theatrical and film agencies.